The Villar Bajwa Practice, Cambridge & London, UK. The purpose of this study was to investigate the return to sport at six months following hip arthroscopy among professional footballers and the factors influencing it. Inclusion criteria: Consecutive patients, professional footballers, hip pathology diagnosis, decision to proceed with surgery. Exclusion criteria: Patients treated without hip arthroscopy. Principal outcome: Return to sport at six months. Secondary outcomes: Non-Arthritic Hip Score (NAHS), Visual Analogue Scale (VAS) for satisfaction. Statistics: Student t-test, chi squared test, descriptive (Microsoft Excel). Mean age: 29 years (SD 6.4). At six months return to sport: 23 / 29 (79.3 %). Mean improvement 14.6 points on NAHS (p < 0.05). Fig. 1: 26-year old professional footballer with significant chondral damage secondary to cam FAI. Fig. 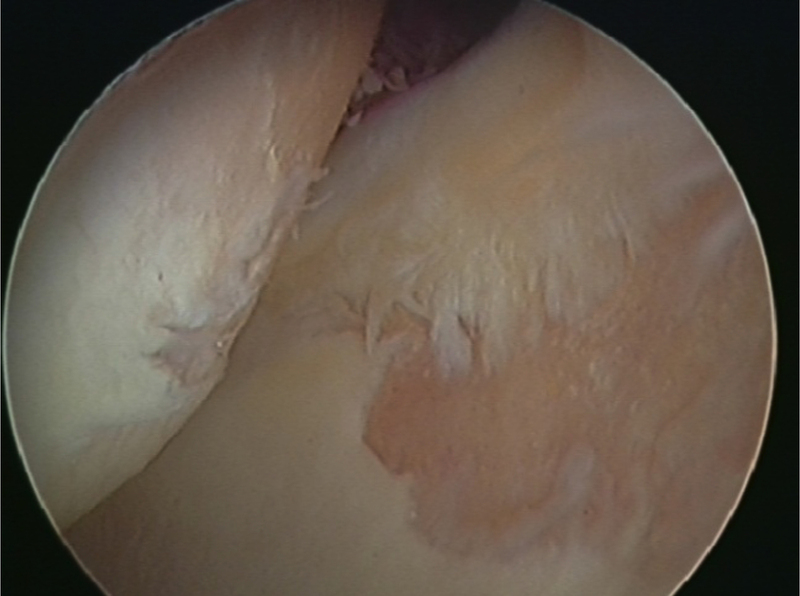 2: Exposure of anterior acetabular rim in a footballer with mixed impingement. A total of 6 athletes out of 29 did not return to sport at six-month post-operatively. Higher grade of chondral damage, ICRS grade ≥ 3 (p < 0.05). Increasing age at the time of surgery (p < 0.05). Not related to specific type of arthroscopic intervention, dominance of limb or the operating time.